Grooming your dog is an ongoing duty, and while there are some things you can do at home like bathing your dog, there are other things best left to a professional groomer. 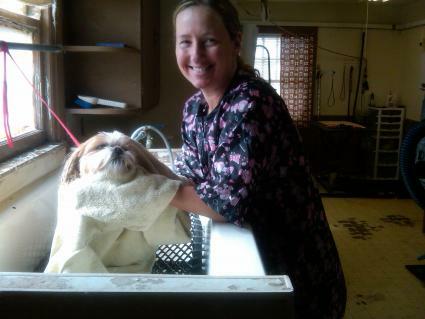 LoveToKnow spoke to Kelly Haggard, co-owner of Clippety Do Dawg, a dog grooming business located in Cumberland, Indiana, about how to best care for your dog's grooming needs. 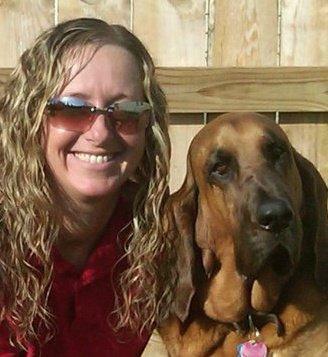 LoveToKnow (LTK): Kelly, how long have you been grooming dogs, and what made you want to get into this business? Kelly Haggard (KH): I have been a groomer since around 1990. I had gone to art school after high school. Since I knew a fine arts degree would not get me far, I was thinking of working with animals. I had always wanted to be a veterinarian when I was a kid, but academically I just didn't have good enough grades in school. One day, I was bathing my family dog, a Miniature Schnauzer named Muffin, and my mom was watching me and said she thought I should become a dog groomer. She started doing some research, found a dog grooming school in Indiana, and signed me up. My love of animals and my artistic nature made dog grooming a good career for me, and the rest is history. LTK: How can regular grooming help people who have mild allergies? KH: It can help a lot. Bathing a dog on a regular basis will remove the dander from the coat that causes allergic reactions for many people. Regular brushing and clipping helps too, if your breed needs this type of grooming. It is amazing how much less a regularly groomed dog will shed, making not only the humans happier, but your pet as well. LTK: What can dog owners do to keep their dogs in tip-top shape between grooming appointments? KH: The best thing they can do is brush their dogs. So often I see these little dogs come in that have not been brushed in months. If I have to clip their hair off, underneath we see things like tumors, warts, ticks and fleas. These things the owner never noticed because they never brushed their dog. By not brushing that coat, the skin can begin to get icky, because you are not distributing the oils in the coat. Also, check those ears and nails. Ears can become yucky overnight, so it is always a good practice to take a peek inside them about once a week or so. Check their nails. If they don't have their nails trimmed regularly, the nails can become very long and break off, sometimes breaking off below the "quick", which is basically a blood vein that runs down the middle of the nail. If this happens, it will bleed profusely, and you will need to take the dog to the vet to have it wrapped. It is very painful for the dog. Imagine never cutting your own toenails for six months and trying to walk on them, curling under your toes? Ouch! If a dog's nails are let go for too long, it will actually deform the foot of the dog, causing permanent damage, called "splaying" of the feet. This is irreversible, and will cause your dog problems walking for the rest of its life. Always keep on top of the nails. LTK: What is the best way to trim black canine nails? This seems to be a real challenge for many owners because it is impossible to tell where the quick is located. KH: You want to just take a little from the end, and gradually work your way back until you see a little black dot inside the nail. This is the end of the blood vessel. The very best advice I can give is to have your groomer show you how to cut the nails, and advise you on the best kind of nail trimmers to use. Some people will also use a Dremmel on their dogs' nails, but again, have your groomer show you before you try it. LTK: You don't take dogs that are biters and most groomers won't. What can an owner do who has a dog that bites when scared? KH: One of the biggest reasons for poor behavior in dogs is poor or no socialization as puppies. Also, taking a pup from its mother too early (before eight weeks of age) means this pup will not have learned things from his mother, like not to bite. You cannot always control the situation you get a pup from, but if you are getting the dog from a breeder, do not take that pup before eight weeks of age. The next best thing you can do for your dog is obedience training. The difference is like night and day between clients' dogs who have had training and ones that have not. A qualified obedience instructor will help you deal with any issues you may be having with your dog. We can only do so much with what we are given. Sometimes there are just dogs we cannot handle, and those dogs are sent to their vet for grooming under sedation. LTK: What about breeds that love to swim? Anything that owners should be doing when they get out of the water - particularly, those floppy-eared breeds like Golden Retrievers and Labradors. KH: Get an ear wash from your vet that dries the ears, and every time your dog swims, be sure to flush the ears really well afterwards. If the ears become wet inside, it can create a yeast type infection, and then you will have to spend money at the vet to get this taken care of. Prevention is my best advice. 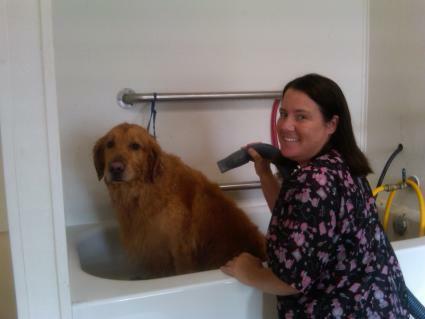 Kelly's partner and sister, Becky Sutton, grooming Hank (Golden Retriever). LTK: How can an owner tell if a groomer knows what she is really doing? Many animals get poor grooming jobs and even get injured at times from groomers without the proper knowledge. KH: Well if the groomer seems nervous while working on your dog, or any dog, or seems not confident, then that might be a red flag. You want someone who is knowledgeable about grooming, and knows many breeds. Also you want someone who is confident and honest. You want a groomer that is going to tell you if your dog misbehaved, because then you know you will have to work on some things. The best way to find out about a groomer is word of mouth. I would say that nearly 75 percent of our new clients are referred to us by another client, a friend, their vet, etc. You want to ask your vet, trainer and friends who have dogs with cute clips who they recommend. LTK: You work with your sister in your grooming business. What is that like? KH: Surprisingly, we get along great! Anyone who has known us our entire lives can tell you that we fought a lot and disagreed about nearly everything as kids! But working together, we have no issues. Actually, we have a good time and find humor in about everything! LTK: What is the funniest thing that's ever happened while grooming a dog? KH: Oh boy, that is a hard one. There are several that top my list, but I would say one very funny one was when we had a dog in for a bath. It was a Great Dane/Lab mix. The dog was huge! It was really hyper, and barked a lot. After finishing its bath, we put it in a large cage to dry with a blower hooked to the cage. After a few minutes, we heard this terribly loud banging noise. We ran to the back room, and this dog had somehow pried the cage door open just enough to squeeze the front half of its body out, but was wedged in that door! The cage is a large, fiberglass unit which has two small cages built in above the large one. This big horse of a dog had pulled the entire cage across the room (it was on wheels) and tipped it sideways! This thing is extremely heavy, it takes two of us just to roll it! That dog was determined he was getting out of there! Also, there were two small dogs in the top cages, shivering in fear, because they had just had the ride of their lives. Needless to say, we called the owners, told them what happened and to come get the dog ASAP, and politely declined to groom this dog ever again. Nice dog, but very determined. Grooming your pet regularly is important to his overall health. Kelly Haggard suggests grooming every four to six weeks. "Also, the groomer can point out any problems your dog is having that maybe you didn't notice." 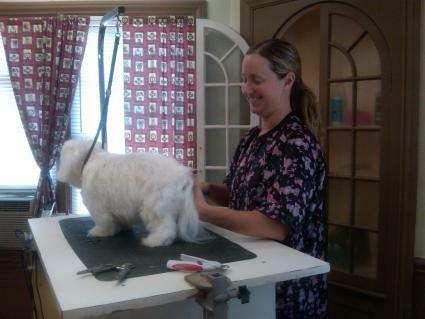 Kelly suggests that the benefits to regular grooming include a healthier coat and healthier skin.